Integra Business Solutions is delighted to announce the date and venue for its 2018 National Conference. 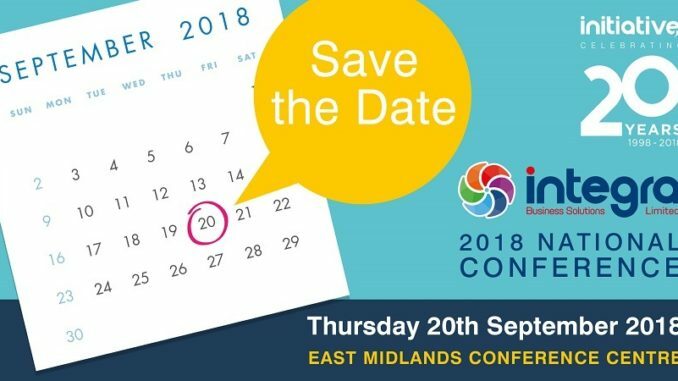 Members and key partners are invited to join Integra on Thursday 20th September at the East Midlands Conference Centre, Nottingham. Integra’s 2018 National Conference will be focused on connecting members with new initiatives and opportunities to further expand their businesses. This event will also be an opportunity to celebrate own brand Initiative’s 20th Anniversary, another important milestone for the group. The Initiative brand, launched in Disneyland, Paris in 1998, is exclusive to members and a key component of Integra membership. Integra will be announcing some exciting promotions, incentives and price support throughout 2018 as a thank you to members for their support of Initiative over the years. Members and suppliers can register to attend the conference by contacting 01633 653000 or emailing [email protected].